THIS is a rooftop garden with a twist. 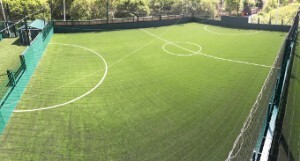 Visitors to Woking Park can now take advantage of new car parking facilities and state-of-the-art 3G sports pitches at Woking Leisure Centre that really give players the chance to hit the heights of Champions League winners Gareth Bale and Cristiano Ronaldo. The car park, which opened on Thursday, May 22, will improve car parking capacity by an additional 261 spaces. The new 3G sports pitches, inventively situated on top of the car park, will revolutionise outdoor sports facilities at Woking Leisure Centre. A grand opening football tournament was held at the £3.5 million site, funded by the council, on Monday. A walkway links the pitches to the rear of Woking Leisure Centre, and additional bicycle racks, promoting a cleaner lifestyle, have also been installed. Woking Borough Council’s Strategic Director, Sue Barham, said: “Woking Park is a popular destination for both residents and visitors. Freedom Leisure’s Area Manager, Stuart Harding, believes the unique setup will prove a big hit with guests.